Ginnels Gates and Ghosts: Oldest object in the city? In a place like York it can be difficult to know what is the oldest thing in the city. My suggestion is this stone. It can be found in the Museum Gardens and is just one in a line of stones marking the edge of the grass. I had to wait for a young family sitting eating their lunch on it to move before I could take this picture. 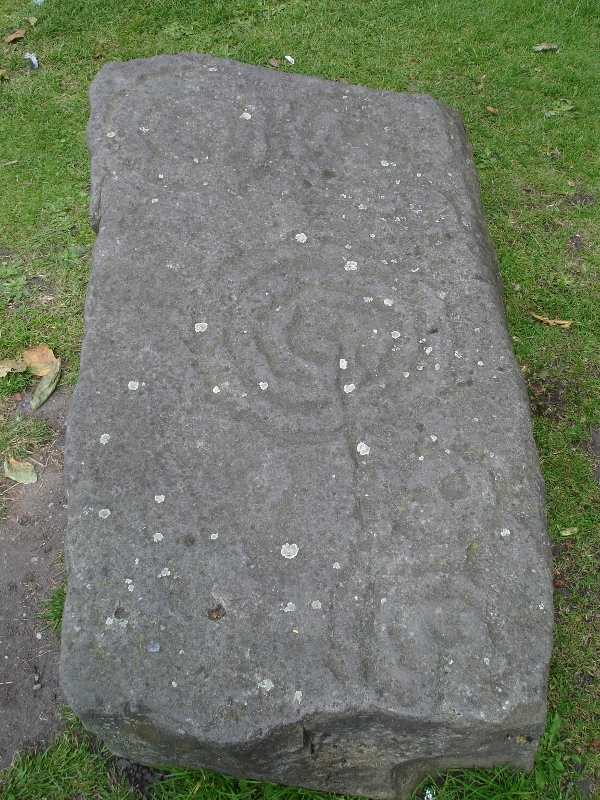 What makes it stand out is those circles and hollows carved into the stone, a design known as cup-and-rings marks. A friend who knows about these things suggests that it may date from the Neolithic era 3.5 to 4 thousand BC. That makes it a 6000 year old picnic table! And the cup and ring marks came from neolithic picnic mugs?! Totally outside my period of history, though I would have guessed pre roman. And someone was eating their lunch on it! I spent a couple of wonderful days long ago in York, I would return in a heartbeat. I don't think I saw this very stone but I did see many wonderful places,walked about half the city wall,visited a toy train shop,a scout troop boot sale,a church rummage and the Viking Centre tour! Thanks for sharing this stone it brought me right back there!